Located on the western outskirts of Paso Robles, Halter Ranch is one of those properties that weaves together so much of what makes the Central Coast great. It’s got history, with an 1885 Victorian farmhouse that hearkens back to the halcyon days of the old Adelaida township and a former airstrip used by Ronald Reagan to announce his second run for California governor in 1967. It’s got stunning natural beauty and abundant wildlife, thanks to the conservation-minded efforts of owner Hansjörg Wyss, a Swiss medical device entrepreneur who bought the property in 2000. And when it comes to wine, Halter Ranch boasts an impressive pedigree: Its 281-acre vineyard, once a major source of grapes for nearby Justin Winery and other big Paso players. But as Halter Ranch shifts from grape growing to produce a commercial brand of its own—its sustainably designed winery can pump out 40,000 cases annually, but today produces about half of that—it finds itself on the frontlines of a quietly brewing battle to save American wine from the latest threat. Like vineyards across California and in other parts of the country, some of Halter Ranch’s vines are suffering from red blotch. It’s a mysterious disease that was first identified about five years ago that turns leaves and veins red. It slows sugar production in the grapes and eventually reduces crop load. Though scientists still don’t know what causes the disease to spread—its cause could be underground, in the air or in the DNA—Halter Ranch’s red blotch raiders are not waiting to fight back. To date, winemaker Kevin Sass and general manager Skylar Stuck have redeveloped 100 of their 281 vineyards acres, usually costing about $30,000 per acre, plus an additional $3,000 per acre in extra testing. They’re also running a whole slate of vineyard trials focused on analyzing the effects of and treatments for red blotch. Though he’s been Halter’s winemaker for just five years, Sass probably has more hands-on experience with the property’s fruit than anybody. In 2000, soon after graduating with a winemaking degree from Fresno State, he started at Justin Winery, serving as winemaker from 2005–10. Halter was then Justin’s largest source of fruit. Stuck hired Sass in February 2011 to expand Halter Ranch’s winemaking. Sass trimmed the vineyard’s 22 varietal wines to 14 and focused on red Bordeauxs, red and white Rhônes, mixing in a little bit of Tempranillo and Petite Sirah. They started to analyze the vines that did not excel—the working is still ongoing—finding that sugar development in the Cinsault and Counoise would reliably stall around 22.5 brix, too low to make a decent wine. Two to three weeks later, the sugars would curiously bounce up. 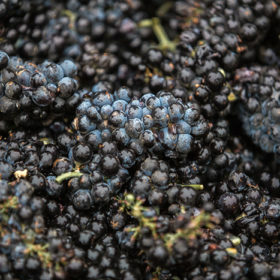 The grapes were becoming more like raisins, with the red blotch blocking the phenolic development of color, tannin and flavor that usually come along with sugar growth. “That makes wine a little bit diluted,” says Sass. So out went the Counoise and Cinsault, as well as Cabernet Franc, also quite susceptible to red blotch. Eventually, in went new, clean and thoroughly tested vines. The jury is still out on the cause of red blotch. UC Davis researcher M.R. Sudarshana said this week that six teams across the country are “working hard to find” it. Sass thinks he knows why it proliferated. “What it turned out to be, and I think is still the case, is that red blotch was in the nurseries when a lot of Paso Robles was planted,” says Sass, “and not just Paso Robles.” Today, nurseries are required to test for the disease before selling plants, and that’s slowing down available supplies. It’s risky to replant in the same area where red blotch once was. If the disease is transferred via the soil, roots or insects, the new vines could be affected, too. However, Halter Ranch’s replantings have yet to show any evidence of the disease. Sass sees Halter Ranch’s efforts as much like fighting cancer, which people treat even though it might come back. Halter Ranch’s brand-new tasting room opens in February.